Hamzah Mangal Zekrya has dedicated his whole career building mechanisms to ensure cooperation across sectors and establish holistic approaches to peace-building and state-building as a stepping stone to sustainable development. His special focus is on Fragility. 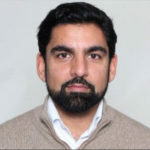 During the last year he has worked for Gavi where he recently switched from coordinating country programs to joining the Public Policy Engagement team, as CSO Advocacy Senior Specialist. Prior to Gavi he worked with the g7+, an intergovernmental group of 20 Fragile States in different stages of transition. His work experience has shaped his expertise in building country systems, promoting local ownership and establishing a mutual accountability frameworks with the international community, in the way they engage in post-conflict mechanisms. His experience also includes working for the International Dialogue for Peacebuilding and Statebuilding (hosted by the OECD), ICRC, IFRC and the Afghan Mission of the UN in Geneva.